Model Jamborettes are curious, they show up for their communities, and they make small acts of courage (like sitting alone in a coffeeshop or buying a lace bodysuit just 'cuz). Are you a #ModelJamborette? Take the survey for a chance to be featured! What are you curious about right now? I am curious about how many children’s lives that I can impact and to what extent. How do you show up for your community? I am currently working on developing group tutoring services that allow lower income children to have access to supplementary education and offer them opportunities to enhance their learning experiences. What is a small act of courage you’ve taken in the last month? Deciding to stick to growing Distinguished Learning is my small act of courage. It was easier to get a steady check while teaching but following my passion and directly impacting the lives of children and their families in so many NYC areas is very rewarding and a personal accomplishment. How do you show up for your community? I am the Co-President of the Rowayton Parents Exchange, a local association of parents with young children. We strive to help parents connect with other parents as well as engage our children in fun and fulfilling activities and ease the transition from city to the 'burbs! What is a small act of courage you’ve taken in the last month? I launched my business website! I wrote super honest content and put myself out there in that way because I believe that being real is the best way to truly connect with others. What are you curious about right now? I'm trying to figure how to balance it all. Being a mother, wife, entrepreneur and just me. It's easy to loose yourself, but I am determined to keep my spirit and identity. How do you show up for your community? 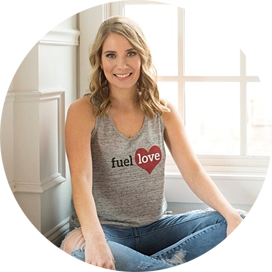 In 2018, I launched Fuel Love, a lifestyle brand that reminds and empowers people to do good and love more. To bring compassion and kindness back into their day, both to themselves and others. I am trying to make this world a better place for us all to live in, including my little girls. What is a small act of courage you've taken in the last month? I started an entrepreneurship program at reSET in Hartford. On opening night, I had to speak in front of 100+ people. I was beyond nervous, but my passion to bring love and positivity back into people's lives got me through it. I fueled some good ol' love to myself and I needed it! What are you curious about right now? Learning how to simplify meal planning! How do you show up for your community? I volunteered to teach an after school program for my daughter's school. I do not have a formal teaching background, so it has been a learning experience but I have loved seeing the world through the eyes of 3rd graders. What is a small act of courage you've taken in the last month? Reaching out to someone (Ashley) on LinkedIn when I saw her share something interesting to me, and it has turned into an awesome connection!